Renowned as the movie brand for the appearances of our watches in over 450 major movies since 1932, Hamilton is now making our debut in a streaming series. Tom Clancy’s Jack Ryan launches globally on Prime Video on August 31. With over 100 million subscribers to the streaming service worldwide, the series will bring Tom Clancy’s character to a whole new audience. 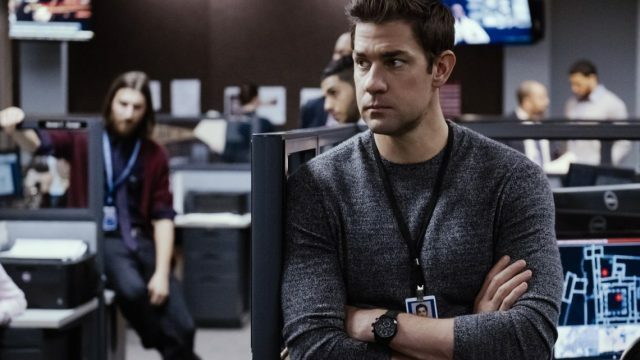 Following in the footsteps of some of the movie world’s biggest names, John Krasinski becomes the latest actor to take on the role of Tom Clancy’s unexpected hero, Jack Ryan. Jack is accompanied by his trusty timepiece – the Hamilton Khaki Field Auto Chrono in full black. Rugged, robust and ready for anything, the watch draws on Hamilton’s rich military history. The 42 mm stainless steel case is PVD coated in full black, creating a stealth look perfect for our hero. With the exclusive Swiss-made H-21 automatic movement beating at the heart of the watch, Jack can rely on 60 hours of power reserve as well as chronograph and day-date functions. A sporty black rubber strap completes the package, offering wearer comfort as well as a snug and secure fit on the wrist.